After you claim phone numbers for your business, you are ready to create contacts, identify users, and assign them phone services and devices to enable communication. Users can be assigned with Virtual Office services or Virtual Contact Center services. 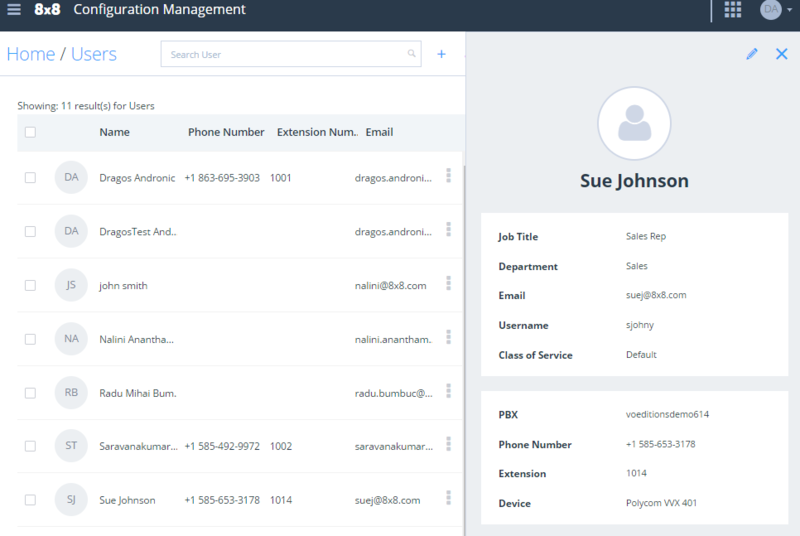 You can also create administrators and give them privileges to manage the phone system configuration. Contacts: A contact is a user without 8x8 services (licenses) and permissions. To create a contact, enter the basic information such as first name, last name, email, username, and site. The contact is created and added to the users list but cannot function as a user as no services or licenses are assigned to them yet. Users: A user is any Virtual Office contact assigned with 8x8 services (licenses) and permissions. If you would like your contact to communicate via phone, you need to promote it to a user by assigning a service, a telephone number, and an extension number. When you create a new user with VO or VCC services, the user receives a welcome email containing their login credentials. Users can log in to the Virtual Office desktop or mobile apps with these credentials, and get connected with the rest of the world. User creation: Ability to create a user, assign a service, and configure the services enabled by the license all from VO-Configuration Manager. Phone number assignment: Ability to assign any available DID and extension number to the user.The extension number must be unique within your system. Sites advantages: Users must belong to a site. The default emergency address, language, and time zone are derived from the user site. Users within a site can call each other using short dialing. Customizable username: The username follows the format of <CompanyName.FirstName.LastName> by default, but can be changed to a unique username of your choice. The company name appears on the Company page. Password Reset: Resetting the user password sends an email to the user to change the password associated with their account. Access to client apps: By default, each user assigned with VO services gets access to VO client apps - Virtual Office desktop app and Virtual Office mobile app. You can optionally assign a hardware endpoint to users. To see the supported devices by 8x8, Inc., see 8x8 supported VoIP and IP phones. Device activation: You can generate a device activation code and send it to the user in a welcome email. If you have a MAC address, enter the address for the device and activate it remotely. The MAC address activation is ideal for users without an email address, such as lobby or computer lab phones. User deactivation: Deactivating a user temporarily suspends the account without the loss of any settings. The user cannot log in and make or receive calls, but can make emergency calls as long as the user is assigned a phone device. User reset: Resetting a user account to the default settings clears the voicemail greeting, removes existing voicemail messages, resets the voicemail password, and removes any call forwarding rules. This allows you to reuse the login for a different user. User deletion: Deleting a user allows you to completely recycle and reuse their license, phone number, device, and extension. The voicemail forwarding rules are also deleted. The deleted user cannot log in to 8x8 applications. The hardware endpoint associated with the user gets deactivated. All user content such as voicemail, call recordings, messages, and fax are deleted. You can search and filter users for easy and quick locating. The results will be saved even if you navigate away from the search screen. Let’s say you searched users with first name ‘John’, the resulted list will be saved until you clear the search entry. To search users, go to Home > Users and enter a search entry. Press Enter on your keyboard to see the results. To remove the search results, clear the search entry and press Enter again. You can generate a users report including name, address, calling ID name, license, device model, site, and more. With a user report, you can quickly find users information, audit, or verify them. You can decide what information to show on your report by selecting or clearing the check boxes for basic and advanced fields. For a quick find, enter the fields you are looking for in the search box. Select the desired columns on the list, and click Generate. A CSV format report is generated. Click Download and open the report. Review and make changes and click Save. Every Virtual Office account has a primary administrator with privileges to configure phone system features using Configuration Manager. As a phone system admin, you can define new users, add call queues or ring groups, check device inventory, add sites, and more. You can assign administrative privileges to any other user added to the phone system. These new company phone system administrators receive similar privileges as the primary administrator. An automatic email notification is sent to the new admin as soon as you promote a user. Every Virtual Office account has one primary administrator with privileges in all categories. This administrator's access can be edited or revoked by another administrator. You can grant administrator privileges to any existing user by adding the user to the administrator's group. Go to Home > Company. Search for a user by first name, last name, email ID, or an extension and add it as an administrator. You can sort users by their name or email addresses. When you promote a user to an admin, the user receives an automatic email notification informing the granting of administrator privileges. You can modify the name or change the properties of the primary administrator, but cannot delete it from the Company or User's page. How do I view a user's information? From Home > Users, enter a user’s name in the search box, and press the Enter key on your keyboard. The user appears in the results. To see a summary of the user information, click the user's row. What does Reset to Default Settings do? 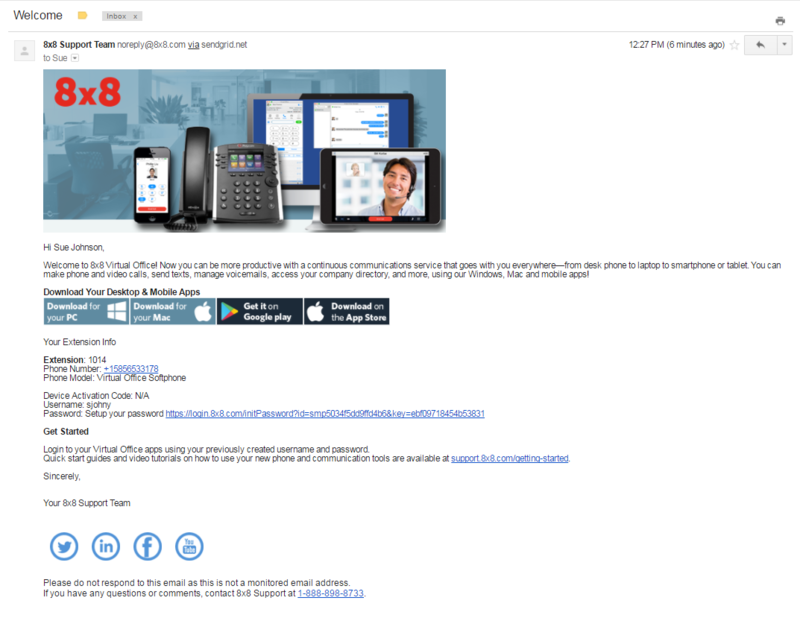 It clears the voicemail greeting, removes the existing voicemail messages, resets the voicemail password, and removes any call forwarding rules. To reset to default settings, from Home > Users, click next to the desired user, and select Reset to Default Settings. How do I reset a user's account password? From Home > Users, click next to the desired user, and select Reset User Password. The user receives an email to change their user account password. How do I send a welcome email to a user? This option is only available to the users with services assigned. From Home > Users, click next to the desired user, and select Send Welcome Email. The user receives a welcome email containing their login information. If you want your users to use Virtual Office desktop app or Virtual Office mobile app, the user has to configure their Virtual Office username and password. The configuration details are sent in the welcome email. From Home > Users, click next to the desired user. The user profile opens in which you can edit the user's account. How do I deactivate a user? How does it affect the user's account? From Home > Users, click next to the desired user, and select Deactivate User. If you proceed, the user cannot log in to any 8x8 applications or make or receive calls, but the user can make emergency calls if the user is assigned a desk phone. How do I delete a user's account? From Home > Users, click next to the desired user, and select Delete User. If you proceed, the user cannot log in to any 8x8 application, any hardware endpoints associated with the user become inactive, the user cannot make calls (including emergency calls) or receive calls. All content such as voicemails, call recordings, messages, and faxes are also deleted. The user's telephone number is released. Can I select a different language for each user? Yes; by default the language under the user's account follows the site's language but you can select a different language for each user. If you change the user's language to a different language other than site's, the language of the voice prompts, email notifications, and device display will be changed to the new language.